Edit 4/2/13 - Edited Application information for Japan Qualifiers. 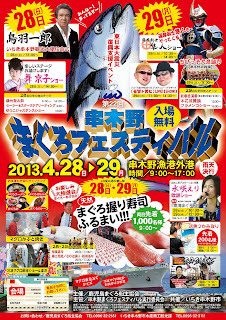 The 22nd Annual Maguro Festival 第22回串木野まぐろフェスティバル will take place the end of this month in Kagoshima Prefecture on Sunday April 28 and Monday April 29, 2013 in the city of Ichiki-Kushikino. This of course happens during Golden Week in Japan. This is a local Tuna event for the port city of Kushikino. It's pretty much a county fair including games for kids, music, food and other activities for the whole family. I asked if the All-Stars were going to Sasuke 29 and he mentioned he wasn't sure. Then we read from Shingo Yamamoto's Facebook page that he was training hard for Sasuke qualifications (So was Takeda) and so I asked if any of the New Generation Stars (Yuuji, Ryo, Kanno and Asa) would be forced to re-qualify and he said no (with the tweet above). That's good! I'm happy they are rewarding their great showing in Sasuke Rising. Currently, it is unknown if the qualifier will be in the same style as the Sasuke 13 Trials that was previously televised on TBS back in 2003. I asked if this will be televised but as of now we don't know. Also, as was announced earlier, Sasuke 29 will double as a qualifier for the November inaugural Sasuke ASEAN Open Cup taking place in Malaysia. Edit: Since the post yesterday the update on the trials has been done on the TBS website with more application news. Remember.. this is ONLY for Japan qualifying for Sasuke 29. Application closes in a couple short weeks: April 19, 2013. 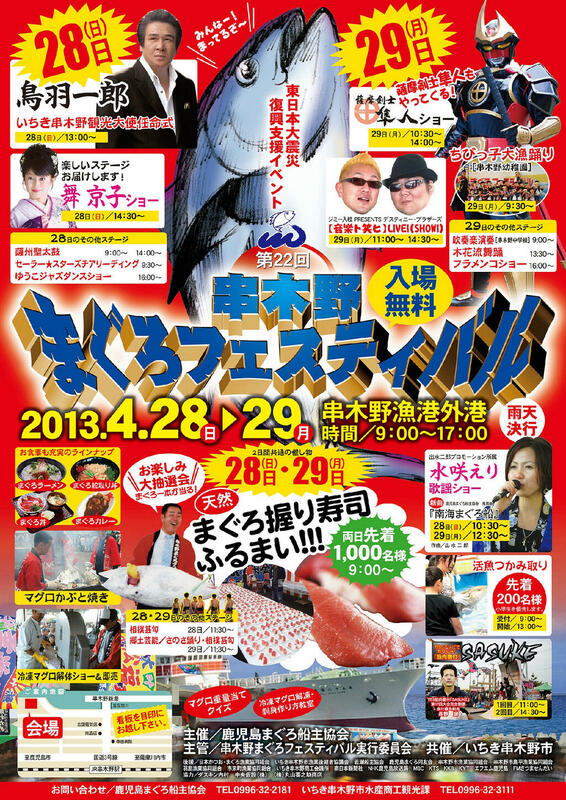 The qualifiers are going to be held at Midoriyama Studios (where they tape Sasuke) on April 27 and April 28, 2013. Women are asked not to apply.. Anyone under the age of 18 now needs a guardian. The only problem I see is the first post above.. That's the SAME WEEKEND AS MAGURO FESTIVAL... Stay tuned. After the inexplicable absence of American Ninja Warrior from Sasuke Rising (Sasuke 28) that taped in November and aired in December, 2012 on TBS Japan we still don't know if the Japanese "Ninja Warrior" will ever return to the States. That said ANW5 is well underway. Matt Iseman tweeted the dates for the 4 Regional Tryouts. Venice Beach (California) April 5-6, 2013. Baltimore, Maryland April 19-20, 2013. Miami, Florida May 4-5, 2013. Denver, Colorado May 19-20, 2013. The finals are still in Las Vegas, Nevada June 10-17, 2013. All of this airs on NBC and the new Esquire TV channel at a later date during the summer. Shingo is going to participate in the Maguro Festival. I asked him on Facebook if he is going to the Festival, and he said yes. Awesome! Great news :D Thanks for asking! Wait, does that mean Shingo's not going to the trials? And if it says "woman are asked not to apply" for the trials then does that mean that they're dropping woman completely, or will their be sone wildcards? Not sure about both. Shingo posted today that he sent his application. We'll see what Inui does with it. He has the right and option to just not send him to trials and straight to Sasuke 29. A few are already getting exemptions. We'll see.